MERIDIAN TWP. — An Aldi grocery store and a 21-unit apartment building on a busy portion of Marsh Road north of Meridian Mall are a step closer to construction. German grocer Aldi Group, which has a distribution center in Webberville and stores in Lansing and Delta Township, will build a 25,000-square-foot store on a 5.4-acre parcel at 5155 Marsh Road next to the township hall complex. Eyde Co. will build the apartment building on the property. Initial plans last December called for two apartment buildings, but Eyde dropped one building amid resident and staff concerns. Treasurer Julie Brixie and trustee Milton Scales cited traffic congestion on Marsh Road as part of their reason for opposing the project. Trustee Angela Wilson was absent. Eyde Chief Counsel Mark Clouse said plans for a traffic signal are progressing, but that wasn’t enough to change Scales’s position. Brixie’s main concerns appeared to be density and traffic. “Strike a few more apartment units and modify the parking lot a little bit, and we’d get to a point where I would be able to think this is a really great project. We’re not at that point yet,” she said. “I don’t think that having apartments above the grocery store is a great idea either. It can be very smelly and you have a lot of traffic,” supervisor Elizabeth LeGoff countered. Now, I'm just thankful that this passed with only two votes in opposition. But, I was surprised with this new board (I believe Democrats swept every office in Meridian Township in 2012) that we get the same old talking points from the opposition. Meridian Township has been very anti-growth, or at least very pro-slow-growth, since for as long as I can remember. What I find odd is how there is still a chunk of the community so adamant against building up the area around the mall. You have to increase density around the mall if you want to keep sprawl out of the fringes of the township which Meridian Township tries so hard to do. Barring densifying the "downtown" around the mall, though, you're essentially saying no to ALL growth. These folks act like Okemos is some kind of exclusive small town. This is a township of probably over 40,000 people, now, and sure it's nice...by suburban Michigan standards, yet they seem to think it's some kind of heaven. It's time to get serious. I mean, complaining even after they cut the second apartment building and now you've only got 21-apartments? Honestly, with suburbs all across the country building, or already having built, legitimate town centers around their malls, if Meridian Township keeps this up, Lansing and East Lansing are going to each their lunch. I'm only ranting about this because it confirms what I heard years ago that Meridian Township tries through its zoning to keep buildings and properties as short and sprawly as possible. I hear that getting something simple as having apartments above storefronts along Grand River is like trying to pull teeth. This makes zero sense to me. If I'm wrong about Meridian Township, I don't mind being corrected, but is it true that you have to get special permits for "apartment-shop" (apartments above ground floor retail/commercial) development? I guess what confuses me is that Meridian Township is in its mind very tough on sprawl, but is then also very tough on urbanizationn around its center. When you try it both ways what you get is what we have, today. Sure, Okemos looks better than Delta Township, but it's not by nearly as much as they think they do, and functionally, Okemos is no more pleasant a place to try to navigate by foot. I think you make a very good point here. Meridian Township, with their behavior, act somewhat to stop developments from leaving Lansing/East Lansing. At the same time, they close their eyes on their own problems. This being a downtown (at the intersection of Okemos and Hamilton Road) that has lost two of its major anchor tenants in the past couple years and then stretches of sprawl along Grand River and the Meridian Mall area that don't offer anything different than the Lansing Mall area besides a couple more expensive restaurants. One thing we learned when we toured the East Lansing / Meridian water conditioning plant, which I believe was built in the 70s, was that they left room on the site to double the size (and capacity) of the plant in the future - as I recall the 1970s population of Meridian township was 40,000, but by 2000 it was projected to grow to 80,000. In fact, in 2000 the population was still about 40,000. David, are you talking about the number of customers between the two municipalities? Because, Meridian Township's population in 1970 was 23,817. "The plant was built in 1973, and there is land set aside directly adjacent to build another mirror image of the plant - it was thought that by about 1990 the population of Meridian Township would be ~150,000. Today the population of Meridian Township is ~40,000, about the same as it was in 1973." Well... that doesn't match what I said, so much for my memory. But there you go. It's really funny that back in the 70's they thought they'd have 150,000 people. lol I can't even imagine what Lansing had projected its population to be around 1990 or 2000, because I know Lansing around that time thought it'd grow forever, too. It's always interesting to see how wrong about the future we are in the past. The LSJ had a story recently about the stalled Douglas J project in downtown Okemos, which would include the building of a large spa building and then an adjacent three-story mixed use building. The big sticking point has been the burying of Consumers power lines, and it seems the township, developer and Consumers are talking through this. The township has put out there that to cut down on the cost of burial (estimated at $1.4) that perhaps the developer and downtown Okemos could pay to bury power distribution lines, but elevate the high voltage lines to 100 feet above the street. I'd rather them just find a way to bury them all, but if this is the only way to get it done, I'm ambivalent. Elevating the lines might make the project logistically possible, but it'd seem to me this would be the same level of blight, just higher over downtown Okemos. In a story detailing Douglas J Salon's move from University Place at 333 Albert in the heart of downtown East Lansing to Eastwood (though, the training institute a block south along Grand River will remain), the LSJ is reporting that Douglas J's expansion project in downtown Okemos will begin in 2016. The company has also announced the planned salon and spa in downtown Okemos will begin construction in the spring of 2016. The new structure, initially planned to be a 25,000-square-foot, three-story building, has been in the works since Douglas J acquired the former Travelers Club restaurant, White Bros. Music and Triple Goddess Bookstore buildings in 2012. Weaver said the plan is now to scale the building back somewhat, although how much smaller is still being determined. “We’re looking to build something which would provide the more intimate feel our clients have asked for,” he said. He hopes to complete at least some demolition of the existing buildings this fall. I hope that scaling back doesn't mean removing the housing component. MERIDIAN TWP. – A proposed development in between industrial buildings and retail stores has been scaled back in response to concerns about its size. The Avenue on Grand River, a mixed-use project with apartments and retail space, would span 235,640 square feet over 12.6 acres on a site east of Dawn Avenue and west of Park Lake Road. 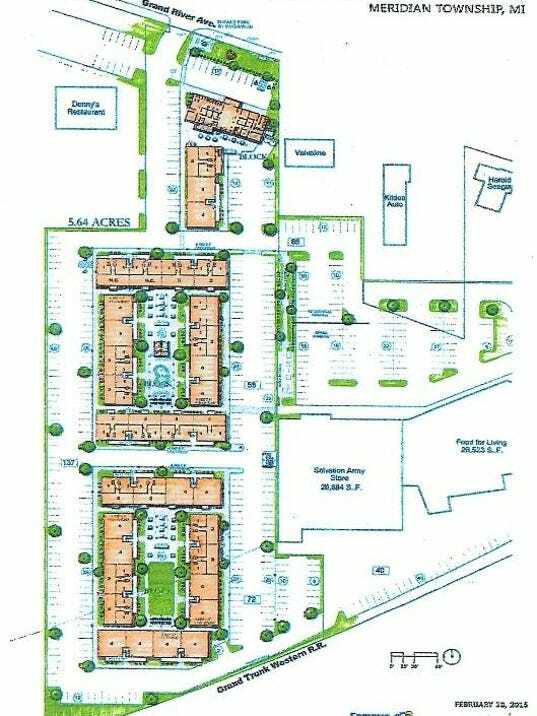 There would be 192 apartments ranging between one and four bedrooms, down from 222, plus just over 15,000 square feet of retail space just west of a shopping center at Park Lake Road and Grand River Avenue that contains Foods for Living, State of Fitness and a Salvation Army store. Based on the Planning Commission response I doubt this will pass. It's the first time I've heard of the project, and it would be a nice one to get built as it will both increase the density along the Grand River corridor as well as add a 4-story building along Grand River. I heard that Meridian Township until fairly recently didn't even allow upper-floor apartments above retail ("apartment shops" in Lansing) on Grand River. Meridian Township is notorious in the region for killing developments with a million cuts as they say. I'd be okay with Meridian Townships slow-growth approach if it was also a smart-growth approach, but they aren't even progressive with their zoning code, which simply means that they delay crappy development. They don't oppose development because it's crappy but because it's always too big a project for their tastes. I guess the other extreme is Delta Township which where big and ugly sprarwl projects get a rubber stamp.